Devolver Digital has revealed that Reigns: Game of Thrones is heading to Nintendo Switch next week. You'll be able to get your hands on it from 11th April. Developed in partnership with the TV show's network HBO, the game is a spin-off in the Reigns strategy game series. You'll be doing everything in your power to claim the Iron Throne as Cersei Lannister, Jon Snow, Daenerys Targaryen, and more favourites from the show, carefully navigating the complex relationships of the Seven Kingdoms. The first two games in the Reign series have actually already been released on Switch in a double pack called Reigns: Kings & Queens. We thought that the games were already like a weird blend of Game of Thrones and Tinder when we reviewed them last year, so perhaps this is a perfect fit? If you want to learn a little more about it, we'll leave you with this lengthy description from the Nintendo store. The game will be available from 11th April for $3.99 / £3.59. I was half expecting this to eventually happen! Congrats, Nerial, on eventually securing the license! Saw this on the App Store last week, thought it looked like a naff mobile game then too. Interesting that the Switch version is 40p cheaper than the mobile version. I'll have to look into the flames to see if the Lord of Light wants me to play this. The Reigns games are proper good fun. Anybody writing them off as mobile games clearly hasn’t played Monument Valley or Florence. That fake Nintendo Direct DID list Tinder as coming to Switch. scrolls down, sees Devolvers Digital is involved Ah - so it is. My wife and son spent about 20 minutes last night wondering why there weren't too many GoT games and were trying to come up w/ good ones. I chimed in w/ an open world game during the reign of the mad king where you get to choose to fight alongside either the king or the Baratheons. Something along the lines of KOTOR or the 2 recent Middle Earth games. Will probably have to buy this b/c we're all a bunch of geeks. This brings us one step closer to Wayne Knight's Adult Pinball!!! 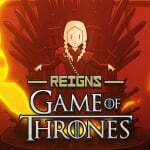 For anybody, like myself, who had no idea what Reigns was, here's a simple tutorial read. Full of spoilers, but it's for the original, not this one. I like reigns, but not enough to get it with a Game of Thrones skin. Best of luck to the dev though! It is a fun concept. It's a fantastic show, the best on TV for me along with Agents of Shield. I dont know what Reign is but I'm tempted by the GoT connection.